With the world’s top horses and riders in action on the second day of the Longines Global Champions Tour Miami Beach, there would always be top sport. Today’s CSI5* class saw a phenomenal display of power and precision, with just .68 of a second splitting the top four finishers after a thrilling jump-off. A scintillating day of show jumping on the edge of the Atlantic Ocean culminated in a blistering, gutsy round handing the win to Maikel van der Vleuten (NED) and his family’s Dutch mare Arera C, by Indoctro. With every millisecond making the difference, many tried to better the Dutch rider’s time but nobody could catch van der Vleuten’s lightning quick jump-off round of 33.09 seconds. Italy’s Alberto Zorzi came within a whisker of the win on the careful, reactive chestnut mare Fair Light van T Heike but could only finish in 33.25 seconds. Great Britain’s Ben Maher rounded out the podium with the 10-year-old Don Vito, while first-to-jump Nicola Philippaerts (BEL) put in a quick pathfinding round in 33.77 seconds on the much-admired 11-year-old H&M Harley vd Bishop. Van der Vleuten and Arera attacked the jump-off course from the get-go: as soon as they took out a stride between the first two fences, the game plan was clear. Tight lines, a fast, consistent rhythm and sympathetic riding meant the pair had their noses in front at the half-way stage of the eight-fence second round. Even a lost stirrup — regained just in time to tackle the next fence — couldn’t hold the pair back, and only added to the excitement for the watching crowds. A huge, bold leap from this gutsy mare over the last fenced sealed the deal. 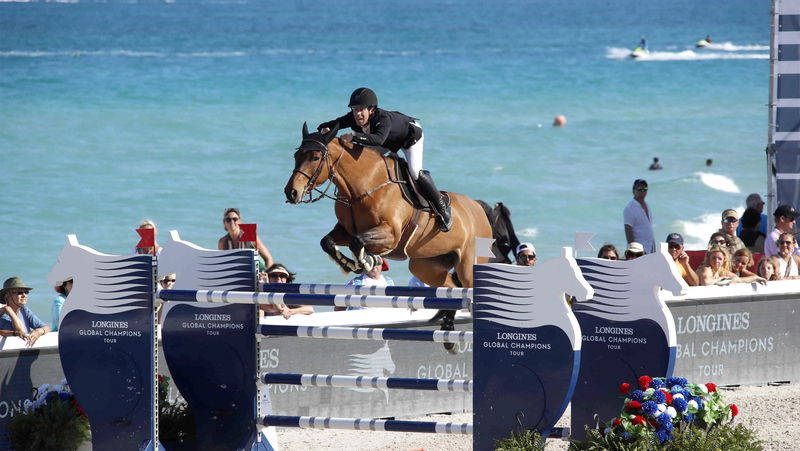 Crowds on the beach hung over the east side of the arena, which is framed by the deep blue Atlantic ocean, and nestled between the sea and the bustle of Miami Beach cityscape, bringing glamorous, fast-paced show jumping to new audiences. Of the 58 starters over the huge five-star track, 11 posted clears in the first round, qualifying through to the jump-off. As shadows lengthened, nine riders chose to jump — with Denis Lynch and Shane Breen opting not to run RMF Echo and Ipswich van de Wolfsakker, instead choosing to keep them fresh for the GCL team showdown tomorrow (Saturday). Italy’s Piergiorgio Bucci (Alicante) and Germany’s Daniel Deusser (Cassini Bay) filled fifth and sixth — completing the top flight of riders to pull off a double clear. In the day’s other CSI5* competition, a speed class, Qatari rider Bassem Mohammed rode a textbook round on the 12-year-old Hanoverian gelding Argelith Squid to take top honours over his 27 challengers. American rider Kirsten Vanderveen finished second on Bull Run’s Divine Fortune, with Ireland’s Bertram Allen (Izzy by Picobello) scooping third. The spectacular LGCT Miami Beach culminates tomorrow, with a jam-packed day of action which will see the 19 teams compete for a coveted podium place on their quest for a starting spot at the GC Prague Play Offs in December, as well as the crowning of this leg’s individual winner in the Longines Global Champions Tour Grand Prix of Miami Beach. Tune in to GC TV to watch all the action live, with expert commentary, insights and analysis. The GCL Miami Beach team competition kicks off at 14:00 local time, with the Longines Global Champions Tour Grand Prix of Miami Beach, the final competition of the weekend, at 17:15.